Speicher 21 lands and two sides of the same coin deliver perfectly to brief. 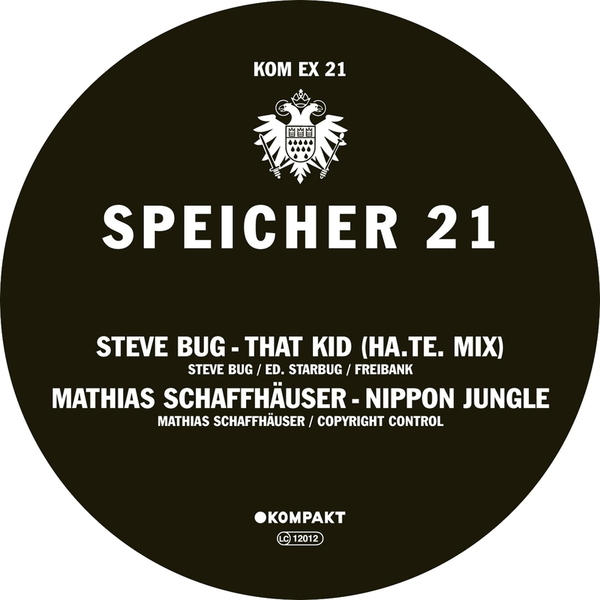 The Steve Bug side 'That kid' hits those heady heights of classic jackin mayhem, barely a fortnight after the shockwaves and repercussions issuing from the DJ Koze bomb. The vibe is pure 1987 hedonism, and that can only be a good thing: bludging bass, smudgy 303's, and when the hihats hit, its not long until a mental, mental breakdown, impulse speed cuts and a impetuous, lost it tonight feel. Matthias Schaffhäuser heads for a more foursquare acid techno formula, but make no mistakes, this is one riffing, snorting beast of a tune - destined to rock the biggest halls. Prime materials - Kompakt fully killing it at the moment with the Speicher series.